What is a section of fence? A section of fence is considered 1 post and 2 rails for a 2 rail fence or 1 post and 3 rails for a 3 rail fence. How long is a single section of fence? 11’ rails make sections 10’ 4” from center-to-center of the posts (you lose 8” due to overlap). 8’ rails are cut long at 8 1/2' so they make sections that are 7’ 10” to 8' from center-to-center of the posts. Round Cedar rails are 10' long and make sections 9' 4" to 9' 6" from center-to-center of the posts. How much fence will I need? If you know the dimensions of the area to be fenced, divide the total linear footage by the rail size (above) to get the number of sections. You will need one post per section, plus a final post at the end, and 2 – 3 rails per section depending on whether you want 2 rail or 3 rail fence. For example, a 100’ length of 3 rail fence would use 11 posts and 30 rails. Plus you should take into account corners, ends and gates. Please call (215) 997-1828 or email pete@splitrailstore.com if you would like help with this. How tall is the fence after it is installed? 3 rail fence is about 4’ high at the top rail. 2 rail fence is about 3’ high at the top rail. Most 3 rail posts are 7’ long (A 3 rail cedar post is 6.5' long). Most 2 rail posts are 6' long. What are the dimensions of the fence? Split rail fence is rough cut so the exact dimensions vary, but line posts are approximately 3” x 6” x 7’ long. End and corner posts are 4” x 4” x 7’ long. Rails come in a variety of shapes, consistent with the old-time rustic look. The basic shapes are triangles, pie shapes (triangle with one rounded face), squares and diamonds. The average girth is 12 – 14”. How deep do you dig the post hole? A 7' 3 rail post should be set 30” deep. This will make to top rail 4' high. 6' 2 rail posts should be set 30” deep. The top rail will be 3' high. ​Cedar posts are generally 6" shorter and can be set 6" shallower (24"). Double check your measurements before finalizing your project, and if you are replacing an old fence do not assume the old posts are the same size. Do you fill the holes with gravel or concrete? No, the hole should be filled only with the dirt that came out of the hole and tamped back in . Concrete is bad for the wood (erodes it), and gravel simply creates a porous pocket where water can collect. Well tamped soil is very stable and waterproof. Some people use concrete for gate posts for additional stability. My pressure treated wood is pine because pine is the best wood for pressure treating. Untreated posts are made of locust, a very hard and long lasting wood. Untreated rails are made of hemlock. 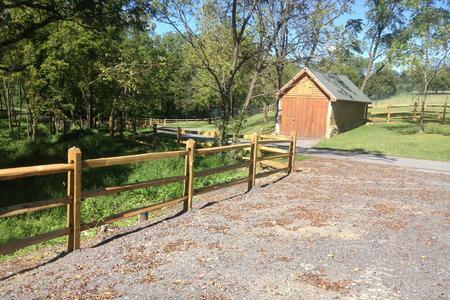 We are also one of the only dealers in the area to carry western red cedar split rail fence. 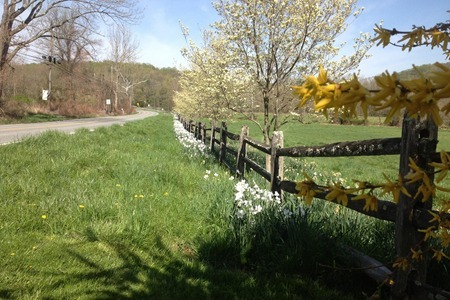 Our pressure treated and locust split rail comes from West Virginia. Most split rail in this area comes from a handful of small mills in West Virginia that have been making split rail for generations. Western Red Cedar comes from a mill in Montana. Round Cedar comes from Ontario, Canada. What is the chemical used for pressure treating? It is a copper based chemical called ACQ. Arsenic based preservatives were used in the past but are no longer commonly in use. ACQ is EPA approved for use around people and pets because the active ingredient is copper which is relatively non toxic. How long will the fence last under normal circumstances? * These are average life expectancies, not a guarantee. Specific conditions will vary. Do I need to do anything to preserve the wood? No, you do not need to do anything to pressure treated wood, locust or cedar to increase its life span. Natural rails will benefit from Thompson's Water Seal or similar. We have 42”, 48”, 60” and 72" single gates and they can be doubled up to make 7’, 8’, 10’ and 12' spans. We do not stock wood gates any wider than this because they tend to wear out and sag. For larger gates we recommend aluminum frame farm gates that come in a variety of large sizes (ask for pricing). Cedar split rail is very rare in this area, but it is catching on because it is beautiful and unique. We are one of the only dealers in the area to carry cedar. It is split, not saw cut, so it is more rustic than traditional split rail. It fits together differently than traditional split rail (mortise and tenon fitting), so it cannot be mixed and matched with other woods. What does delivery and installation cost? Installation is generally $5.75 to $8.00 per linear foot of fence needed, depending on your location and the fence type and as long as there are no special circumstances. Delivery depends on where you are located. Give us a call or email with your location and we can give you the delivery charge and a free estimate for installation. How long does it take to turn around an order? Depending on our schedule deliveries generally take a couple days and installation can usually be scheduled in a week (up to 3 - 4 weeks in Spring). Can split rail fence be used to contain dogs? Yes. By attaching welded wire to the split rail fence, it makes an ideal dog containment fence. 3 rail fence with 4' high wire is recommended for most dogs. Is split rail good for horses?